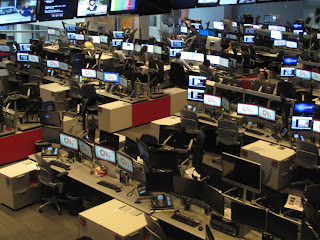 DJ and I toured the CNN studios in Atlanta Sunday. I almost bought a house last week in Duluth. I wasn't quite fast enough on the trigger. Someone else got the deal a few hours ahead of me. There are some really good deals out there when you are bottom fishing like me. Maybe you are already dealing a lot with real estate but if not: the other day I read the bestseller 'Rich Dad, Poor Dad' where it's a lot about real estate as a good way of investing. I don't know anything about real estate but it was kind of an eye opener because -as it seems- real estate, when bought for your own use instead of for renting it out and for making money off of it, is actually rather a liability than an asset. Kind of turns the whole picture upside-down because one always hears 'your own house is your best asset'. Surely that can be true, but it seems as if in most cases it's rather a liability (in the meaning of a big to huge financial burden), at least for many to most. Contrary investing and true liquidation value. One of the truly unique things about real estate is land. Land cannot be depreciated. Why is that? Can a particular structure on a piece of land make the land more valuable? Investment in a car has a terrible ROI except when you take into account that the car is getting you to work, right? As usual I feel I am being cryptic. I really don't mean to be.